I have another awesome giveaway. 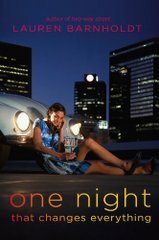 Simon & Schuster offered five copies of One Night That Changes Everything by Lauren Barnholdt to giveaway in a contest. Here is a bit about the book. Eliza, 17, loses her possessions on a regular basis. None of them, however, matters as much as her purple notebook. Her notebook is where she lists the things she would love to do but is most afraid of doing, from asking a random guy to dance at a club to kissing a secret crush. Via text messages, she learns that her notebook is in the hands of her evil ex-boyfriend, Cooper. He and his friends, who are some of the most popular boys in school, threaten to make the contents of Eliza's notebook public unless she spends one night doing some of the things on her list. How Eliza goes about trying to overcome her fears is both hilarious and inspiring; readers will rejoice with her when she sees that she's survived and boosted her bravery. The frankly funny dialogue, related in Eliza's first-person voice, provides more laugh moments while ably delineating character. A satisfying look at what it means to face your fears. The contest is open to USA addresses only, until July 23rd. Just fill out the form below to enter. There will be five winners. this book had me at the cover. I know we all secretly have a wish list of things to do or wouldn't dare do but have always wanted to. It would be fun to read this book and get an insight on how other people tackle their fears and inner desires.